Artificial lighting was first invented to illuminate a room in times of darkness. But recently, beyond just the purpose of illumination, artificial light is more of being used as an aesthetic element in the modern architecture of many kinds of spaces. Conservation of energy is also one of the main considerations in the modern life of the human race. Artificial lighting accounts to about 15% of the energy consumption of a typical building. It is then obvious that it depends on the supply of energy and this energy – which is mostly of electrical form – should be used efficiently. Old model bulbs were made of incandescent globes which use a tungsten filament enclosed in an air-tight clear glass case filled with an inert gas. A high electrical current is used to heat the filament until it glows while the inert gas protects the filament from oxidation. This process is estimated to use around 5% of the electrical energy to produce light and the rest is converted to heat. 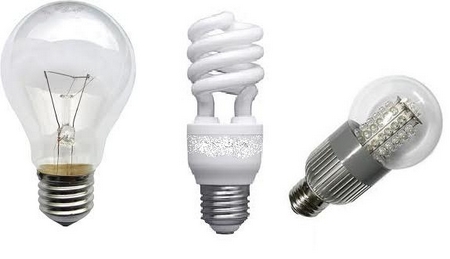 New electrical bulb inventions mostly concentrate on improving this disadvantage. Two of the most common such electrical bulbs are the Light Emitting Diode (LED) bulb and Compact Fluorescent Light (CFL) bulb. These new-tech bulbs are designed to replace the incandescent bulb in form and function but with a much improved efficiency of converting electrical energy to light. However the use of any of the two has its own pros and cons.